I begin by lying at the foot of the rock wall, holding it as if it were a partner sleeping. After some time I slowly negotiate my feet and body to turn over myself and roll to the next position. I enter a number of images that activate meaning in the unique space via my body. I become covered in rock dust, and once naked, small grazes and cuts against the textures of the room. 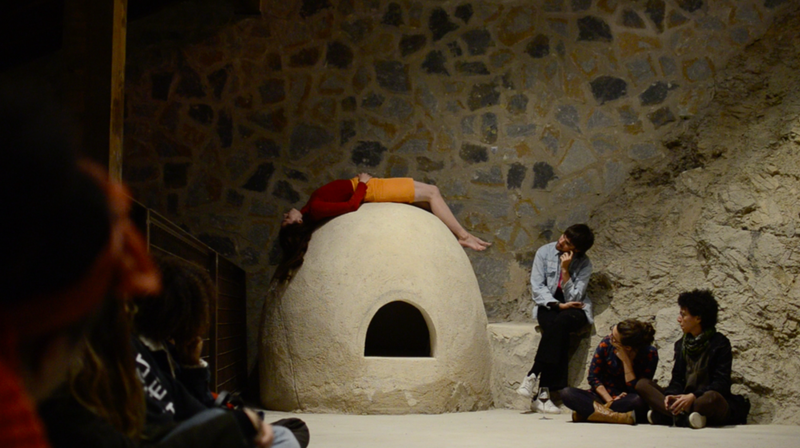 The images include: reclined over the ancient clay oven; balancing inverted on the fence; being swallowed by the oven; having a silent conversation with my upper body hidden; emerging from the oven naked as if being born; rolling into a ball at the foot of the rock; balancing naked on the fence and slamming into a large wooden beam; hugging the beam. This is a series of negotiations with body in specific space that raises issues of care, desire, violence, relating, vulnerability, as well as the disjunction between the image and the experience of the body.